Without thinking too much into it, every professional athlete and every amateur athlete for that matter knows of the physical risk they put themselves in every time they step onto the court, field or take the ice. The physicality and intensity involved with a sport such as professional football, combined with the split second decisions made during each play as well as high running emotions, can make for an ugly outcome if all parties are not in the clearest mindset. Unfortunately, at times a split second wrong decision can have a lifetime effect on one or more individuals or can change people’s views on the character and integrity of a player. Unfortunately for Shea Emry of the CFL’s Montreal Alouettes, a wrong decision brought on by high in-game emotions landed the Richmond, British Columbia native in some hot water and brought on a persona completely opposite to what he’s been working on off the field. “Over the last few weeks I did something on the football field that really wasn’t in line with my character off the field and I got fined for it and people have been calling me classless and a coward and that kind of stuff,” explained Emry. “That was difficult for me because I’m trying to do so much off the field to combat what was happening on the field, but it was difficult because on social media people were calling me all these names when really they don’t know me on a day-to-day level,” he added. Emry has been playing for the Alouettes since 2008. Last season Emry suffered a concussion, which held him inactive for most of the season. A football player at heart, his injury kept him off the field completely and started to diminish his self-worth, as he was unable to remain active with his teammates. The isolation led to depression and forced Emry to look within himself to redefine him as more than just a football player. As he became more comfortable with himself the realization that his desire to give back to the community that had given him so much was just as strong as his love for football. “I really wanted to do what I could to help the community that has given me so much. I didn’t really go out there and approach anyone, it kind of just started slowly coming and I just accepted every chance I got. I had people approaching me about helping them out with anything I could and it just kind of sprouted to me getting involved with different organizations,” Shea elucidated. Since then, Emry has really gotten involved personally and hasn’t slowed down one bit, even with his return to the Als lineup. From speaking with young students about various subjects, to assisting in Turkey Drives during the Thanksgiving season, Emry does his best to accept every community offer sent his way and has worked with countless foundations and organizations that gear to causes from mental illness awareness to concussion education, to anti-bullying campaigns. “I’m getting involved with an organization called AMI Quebec, which is Action on Mental Illness in Quebec. I haven’t actually done anything with them yet, but we’re trying to set up a date here within the next week or two for me to talk at the conference about my concussion and what kind of things I’ve been through,” explained Emry. The 2008 first-round selection also applauds the work done by everyday people in the community who make it possible for our youth to excel and participate in things such as organized sports and recreation. His work with the Montreal Community Cares Foundation recognizes these everyday heroes. 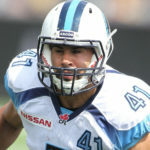 Though looked at through a negative scope for some people surrounding the CFL, there is not enough bad press to take away all that Shea Emry has worked to accomplish both in his hometown of Richmond, British Columbia, and in the city of Montreal in just over a year. His work may have started as a personal goal in fulfillment for self-worth, but it has quickly grown into a genuine love for his community and his fans, making him the man he is today. “At the beginning, it was more about personal growth and really just wanting to get out there and help the community. I didn’t know how much or what I’d receive at first, but when I have kids coming up to me and telling me their stories after I just opened up so much to them it really opens your eyes as to what some people are going through and it gives you a perspective and a want to do something to make a difference and to be active in the community,” said Emry.